If all of that sounds a little heavy, rest assured the show mixes in three or four parts comedy to one part moral. Throw in some surprisingly affecting drama, and you wind up with something that feels like a kid's show that's grown up, moved to modern-day San Francisco, and is trying to put on a brave face to keep the world from seeing how hurt and isolated it sometimes feels. But, again, it's also really funny. Let's talk about the Christmas episode. "Christmas Parties" was aired towards the end of the second season. 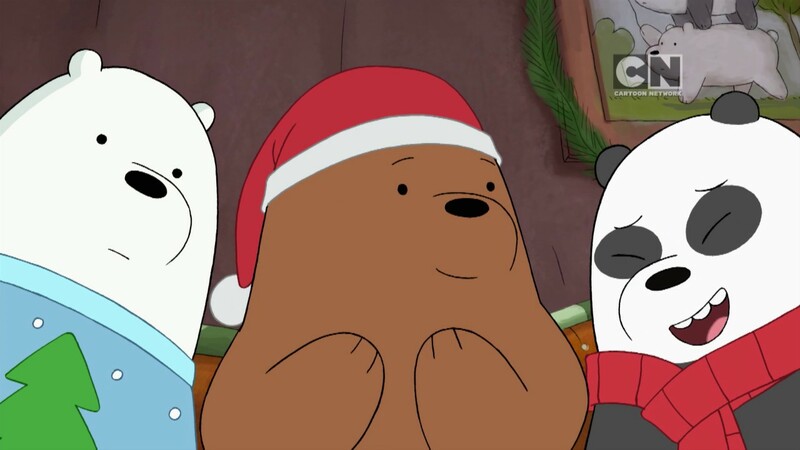 The premise is that the three bears - Grizzly, Panda, and Ice Bear (Ice Bear is your favorite) - have been invited to four Christmas parties on Christmas Eve. This is something of a shock to them: their previous record seems to have been zero. But the events of the series have left them with a handful of friends, each of whom wants the bears at their party. Well, that's true for three of the four invites, anyway. The last was sent on behalf of Nom Nom, a koala who's an online celebrity. I wouldn't exactly describe him as the series villain, but he's as close as the show has. That said, he's also rich, and his invite promises a massive celebration and a free puppy. Rather than choose, the bears resolve to make brief stops at the first three parties before going to Nom Nom's bash. This goes about as poorly as it could. To be fair, they only actually ruin one party - the first two, they just leave the way they found them. The one they break, though, belongs to Chloe, who's probably their best friend. They feel bad as they make their way to Nom Nom's, though they're briefly swept up by the scale of the bash... at least until Nom Nom informs them they were invited by mistake and aren't wanted. The episode ends with the bears making amends with their friends in clever ways. There's nothing revolutionary about the premise of this episode, but the show does a good job on the content. The parties highlight their friends' (and Nom Nom's) natures and personalities well, and everyone gets a good moment or two. The music department put in some overtime in this one. It's easy to miss if you're not paying attention, but the episode uses background music to evoke numerous eras and tones. They incorporate a few moments from A Charlie Brown Christmas (which is logical, since they also borrow thematic elements of friendship and community over commercialism and trappings). It's a solid episode, though I wouldn't recommend watching it first. You'd probably enjoy it well enough if you did, but you'd be better off starting from the beginning... which you should definitely do. This weird little show is incredibly rewarding, plus it offers a nice change of pace.